Don’t mess with my Toot Toot. It is time to make toot vodka. Toot is the Armenian name for the mulberry– we have white and dark purple varieties here. The white mulberries, larval-looking but honied in taste, are the most prized. A couple of days ago, we spread tarpaulins on the street outside the house–passing cars were expected to swerve–and got ready to harvest. Artur climbed the tree and shook branches till the white mulberries rained. His mother and youngest daughter were the ground staff–filling old margarine crocks with fruit they wanted to enjoy later. Then Artur shook the fruit from the tarpaulins into giant metal buckets where the berries will ferment. He’ll set up a homemade still outside my bedroom. We are all saving plastic bottles–we’ll have about 70 liters to see us through the winter. 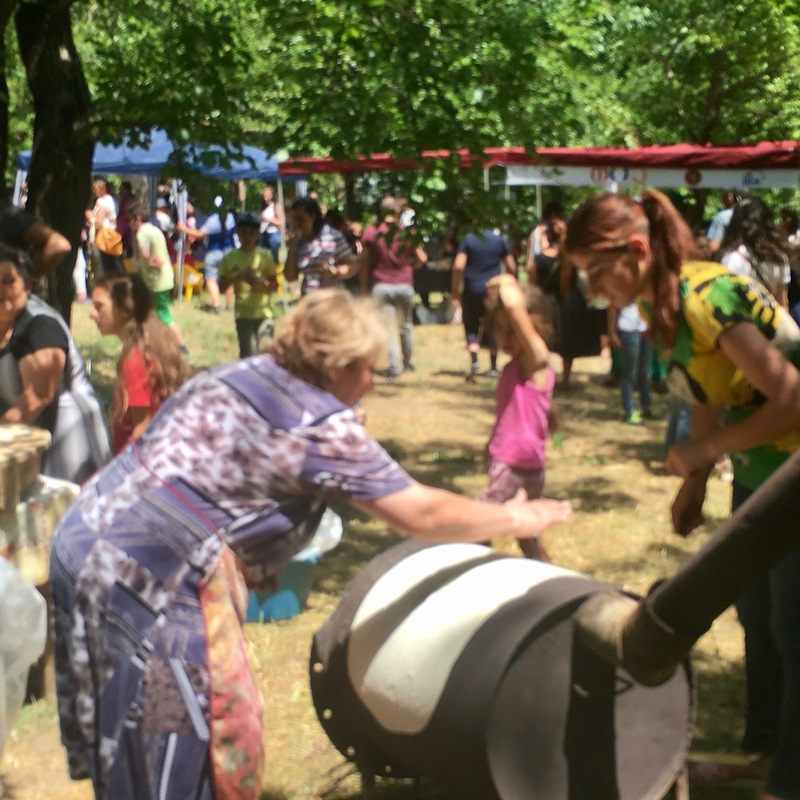 Goris had a mulberry festival this weekend, a small civic attempt to draw tourists to our town. I went to the festival with Pat, a fellow Peace Corps volunteer, also from Maryland. Like me, she came to Peace Corps in her prime, and some decades after graduating college. Like me, she helps local organizations develop strategic thinking and management skills, and helps with branding, marketing, communications and sales plans. It can be uphill work in a country where local customers have no money, and where foreign buyers are unreachable. There is no access to Paypal or Etsy and the postal service is at best capricious. There is no way of taking money direct from the diaspora and no way of being sure that shipping will work. 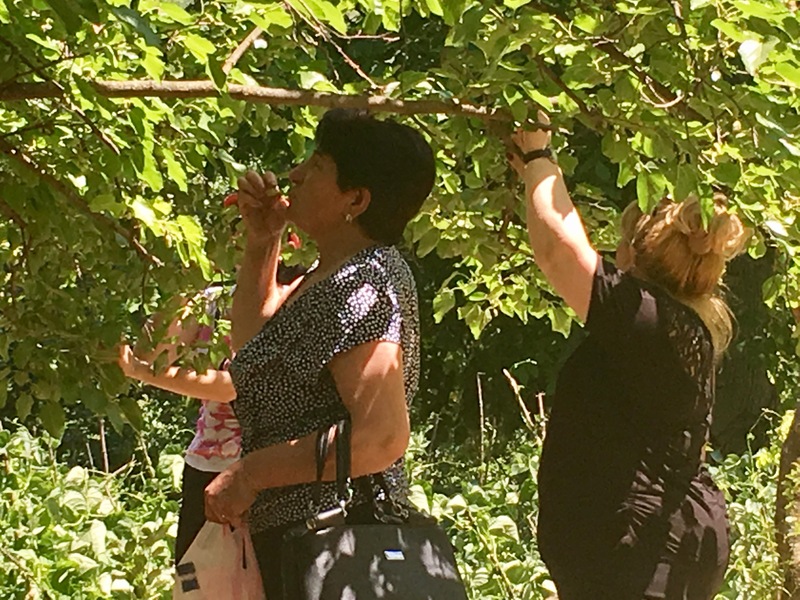 Everyone competes for the dollars of one million tourists who visit Armenia each year. Like me, Pat likes it here, although her two years of service are nearly over. She goes home next month. 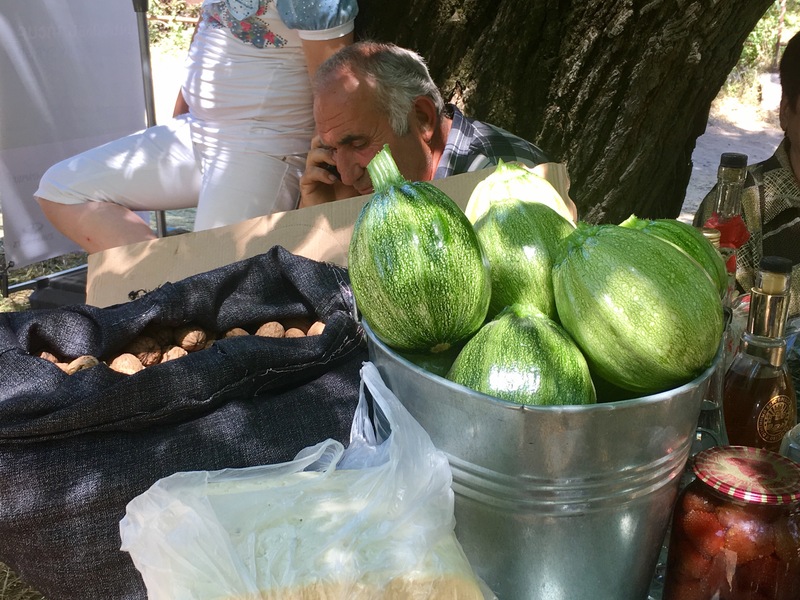 Armenians do not come easily to capitalism, perhaps because of their recent Soviet past, and perhaps because they are just too kind and generous to charge anyone for anything. 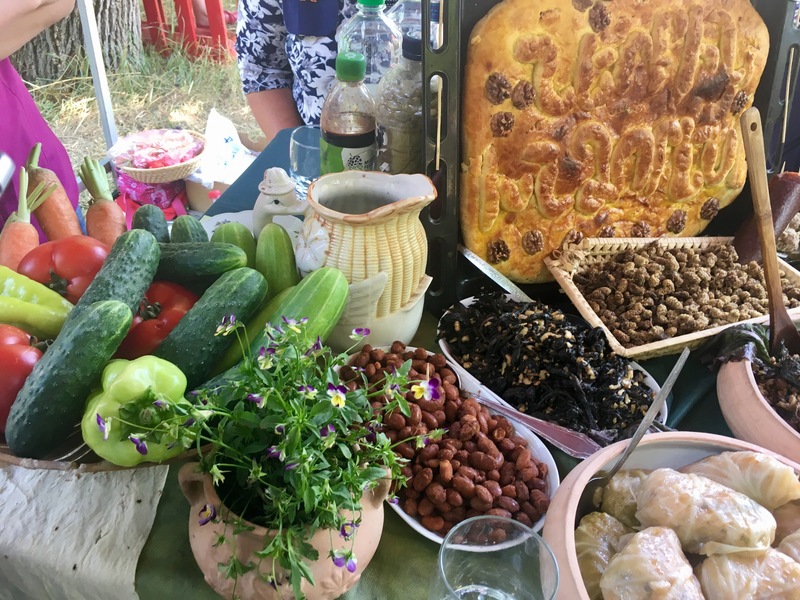 At the festival, held in a bumpy, downward sloping field, they offer plates of fish stew, bean salad, dolma and beetroot vinaigrette to enjoy with free drinks. People pillage small stalls to pile their plates, picking through the food they want to try, and leaving the displays looking like Tom Jones’ dinner table several hours after Fielding’s description of the feast. It is an unholy, unhygienic mess. 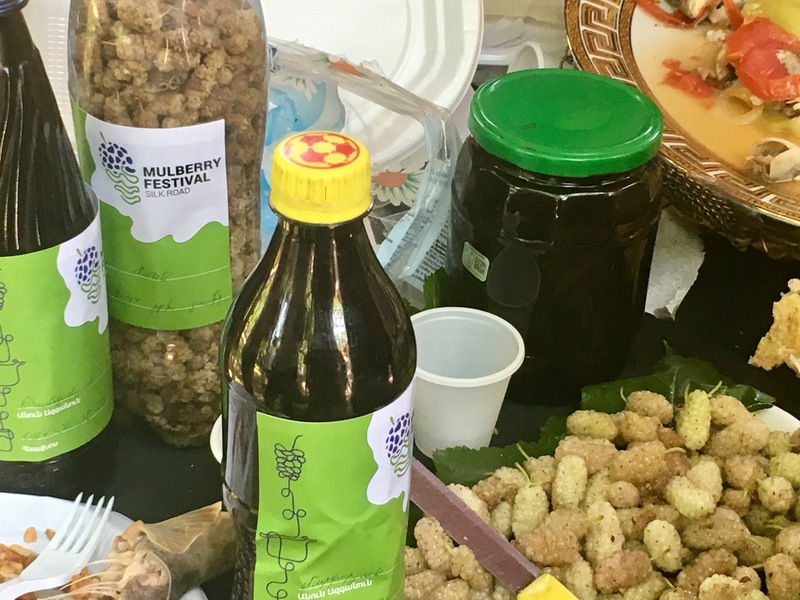 The stall holders do sell packaged mulberry products– vodka, wine, a syrup that is good for the throat, and jam. 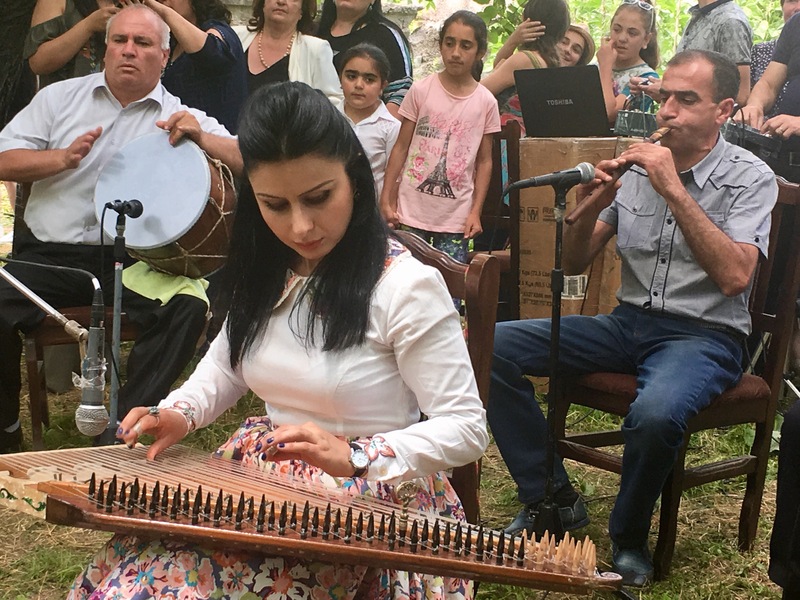 A liter of wine in an old Coke bottle will cost 1000 Armenian dram– about $2. Half a liter of vodka in a water bottle costs $3. No one has bothered to switch the labels from the original bottles. I fear for the toddler who reaches into his mother’s shopping bag for a thirst-quenching glug from what looks to be a bottle of Jermuk’s finest spring water. A mouthful of mulberry ori is far from mother’s milk. 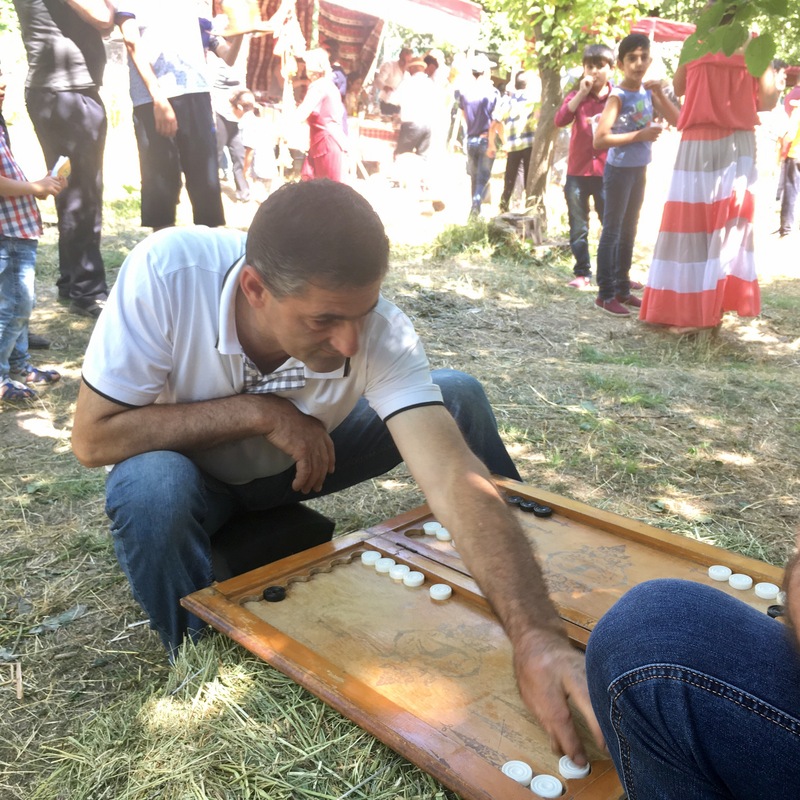 Sitting on a haybale in the shade, Pat and I watched people eating mulberries straight from the trees and kept an eye on a game of nardi– the local name for backgammon. We ate pistachio nougat and baklava while she drank a tot of vodka and I sampled the local red wine. We got chatting to a gay couple from Australia. 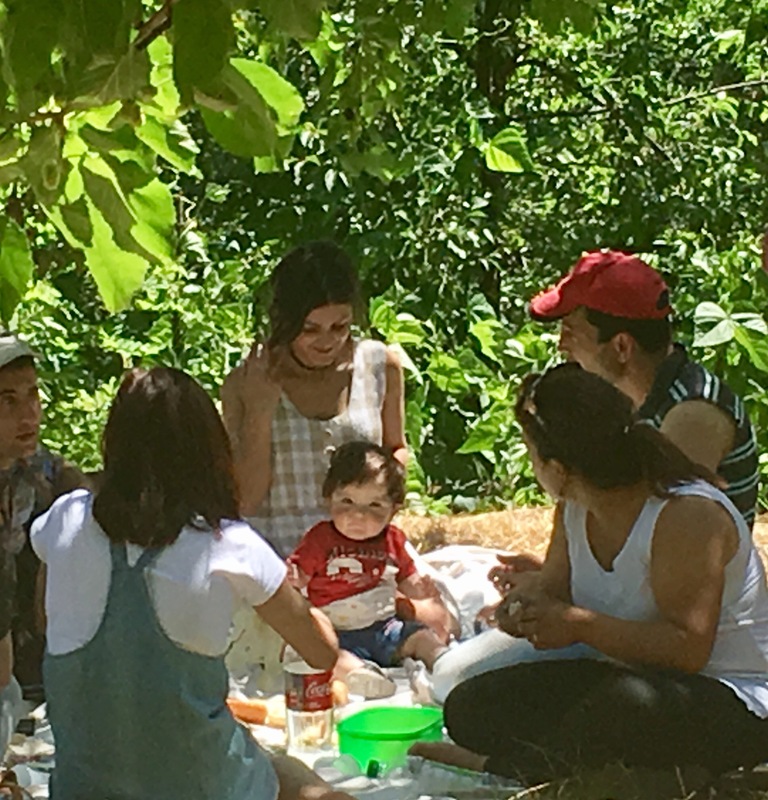 They had just come from Iran, a couple of hundred miles south of here, and they are on their way to Georgia, many hours of travel north, after a short trip to Nagorno-Karabakh, which is just down the road. “Try the beetroot with the sheep cheese” said the taller Aussie. “And get your mulberry wine from the French guy over there.” Homosexuality is illegal in Armenia and, let’s face it, not likely to win friends in Iran. I asked the less lanky antipodean if they had felt under threat. “Not at all” he said. “Iran is surprisingly secular. It was Ramadan when we were there but no-one we stayed with was fasting. Everyone was very friendly–glad to see us. It’s not at all like you see on TV.” I fear I may never know. Current US/Iran relations mean that Peace Corps Volunteers are forbidden to travel to Tehran. Three teenage boys rode by on a hijacked donkey. Vodka may have been involved. 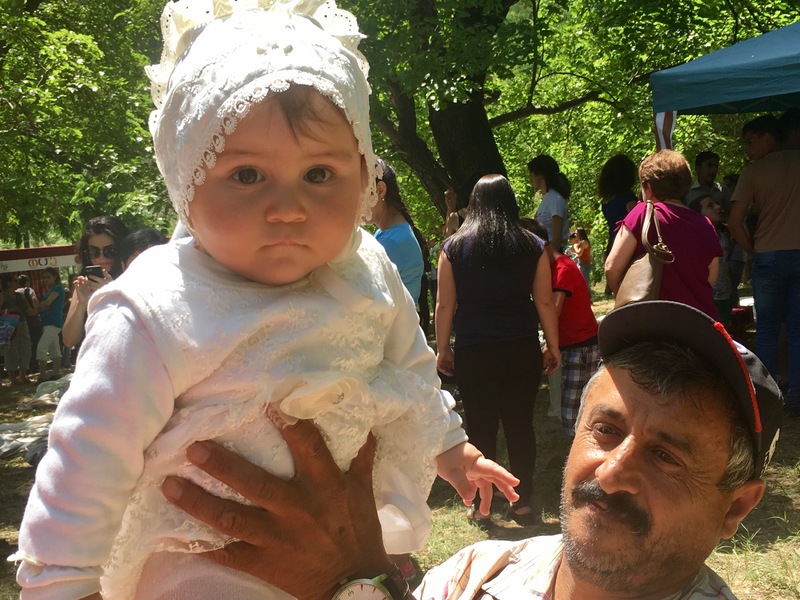 An Armenian grandfather showed off his overdressed baby to this American grandmother. A Japanese American with a man bun sampled the green beans, fish dolma and red currants. We ate cherries and talked to a Czech tourist. 10-year-old boys in itchy vests of Armenian design got ready to dance. The duduk player blew out his cheeks one last time. His instrument, uniquely Armenian, sounds like a mix between a gazoo and irish pipes. A beautifully melancholy sound. 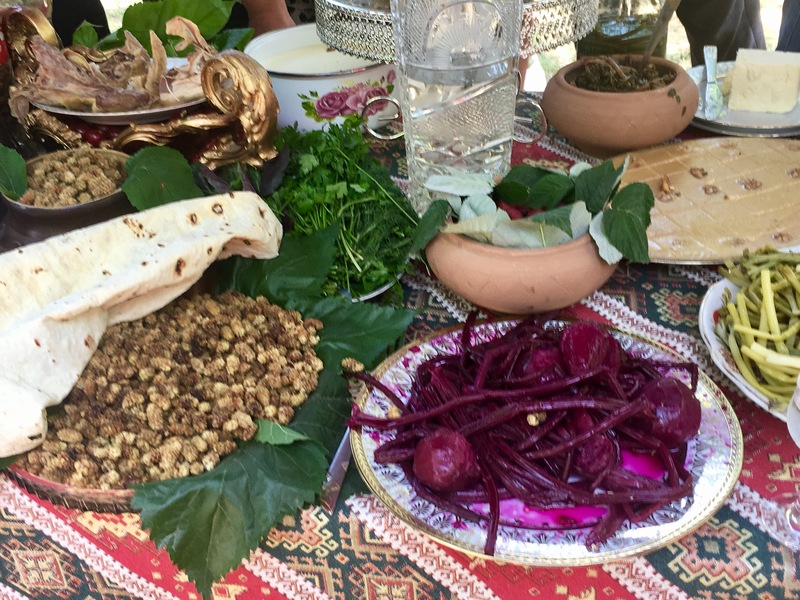 This entry was posted in Armenia, Capitalism, Caucausus, Cooking, Cross-cultural understanding, drinking, Food, Homebrew, Moonshine, Mulberries, Peace Corps, Syunik Marz, travel, Village life, Vodka. Bookmark the permalink.